1. 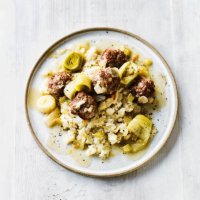 Heat the oil in a deep sauté pan, add the pork meatballs and cook for about 5 minutes over a medium heat, turning often until lightly browned. Lift out with a slotted spoon onto a plate. 2. Add the soffritto and leeks to the pan, and cook for 4-5 minutes until the leeks soften. Pour in the stock, mustard and vinegar, and bring to a simmer before adding the meatballs. Cover and simmer for 15 minutes. Meanwhile, cook the celeriac according to the pack instructions, then mash with the butter and keep hot. 3. Blend the cornflour with a little water, stir into the casserole pan and simmer gently until thickened. Season. Serve with the celeriac mash. Source of fibre; 2 of your 5 day. This recipe was first published in Wed Feb 13 09:02:56 GMT 2019.